Government moves to encourage householders to pay water charges will leave poor families with just a “trickle of water”, Opposition parties have warned. The claims follow a report in yesterday’s Irish Times that new legislation will allow for Irish Water – the new body responsible for water services – to cut water pressure to the homes of those who fail to pay the new fees. Sinn Féin criticised the move as a threat to families and an attempt to bully those who cannot afford to pay the new charges. The cost of water charges has yet to be formally agreed but informed sources indicate the cost to an average household will be in the region of between €100 and €300 a year. The first bills are likely to arrive in about 18 months. Government officials say any attempts to cut the pressure of water to charge defaulters will be targeted at those who opt not to pay, rather than those who cannot afford to pay. Such a move would only occur after customers have refused all options available to pay their bills, according to senior sources. But Mr Stanley said the charges will be a major burden for struggling families and are likely to increase over time. “In Denmark with a population similar to our own, water metering is in place and in 2007 the average cost was €715 per household,” he said . The Socialist Party also criticised the move as another “austerity tax” and called on communities to resist the charges. 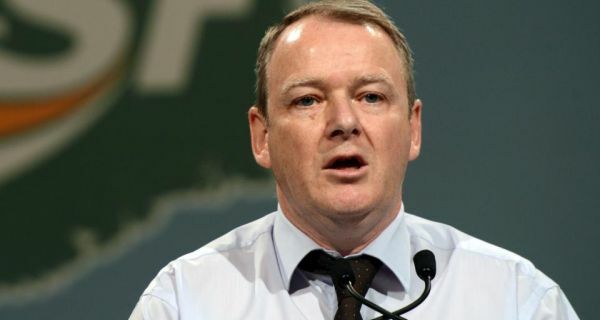 MEP Joe Higgins said the threat to cut water pressure was part of a “bullying, propaganda” campaign ahead of the introduction of charges. Both Sinn Féin and the Socialist Party have called for alternatives to water charges. Mr Stanley said his party supported the introduction of “district metering” as opposed to installing domestic water meters in every household. “It is cheaper, more effective and already operates successfully in Laois,” he said. Under the Government’s proposed moves, Mr Stanley said householders will end up paying hefty bills for the installation of meters. Mr Higgins said it would make greater sense to divert the money being used to install water meters into fixing the leaks in our water supply. This, he said, would provide employment and result in savings for the State and consumers. Minister for the Environment Phil Hogan, however, has said that money is needed to pay for the cost of treating water and waste-water, estimated at €1.2 billion each year. He has said that about 1,600 jobs will be created as part of the roll-out of more than one million water meters, while a further 2,000 jobs could be generated through an investment programme for upgrading water pipes and other infrastructure. No householders will have to pay up-front fees for the installation of water meters. However, these charges are likely to form part of standing fees for all homes.